So the truth is that I usually don't celebrate Valentine's Day (feels a little too commercial). I just spent the last hour looking at cute, pink, Valentine's every thing on Pinterest. Seriously, guys, it's killing me. Some people are so incredibly crafty. There were these pictures of bananas with “I'm bananas over you” written on them. Would it be super cheesy to leave one in my handsome man's work bag tomorrow morning? Umm ya, I think so. And I think I'll do it anyway. I'm feeling a little embarrassed for myself already. And there were these super adorable heart-shaped cutouts with ‘arrow' pencils through them that said, “You're all write!” and decorated mason jars filled with red and pink candy and so many seriously cute and distracting photos. It's almost too much for me to handle. Fueled with Pinterest inspiration and armed with a rolling pin and a heart shaped cookie cutter my Valentine's Day started to look a lot more whimsical. A lot more Pinterest-y. A lot sweeter. I owe a great big giant THANK YOU to Shelly from Cookies and Cups and her trick to pour the icing over the cookies. 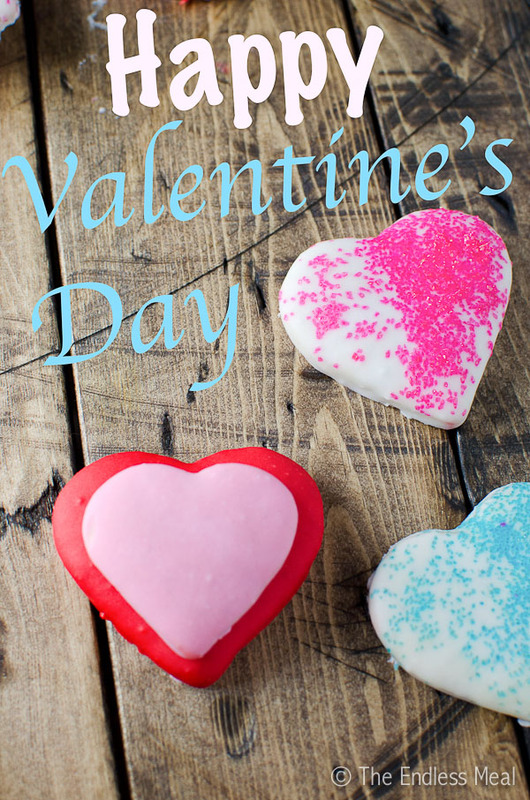 It saved me hours of fussy decorating and made me feel like I *might* be able to hold my own next to those crafty Pinterest goddesses of Valentine's cuteness. 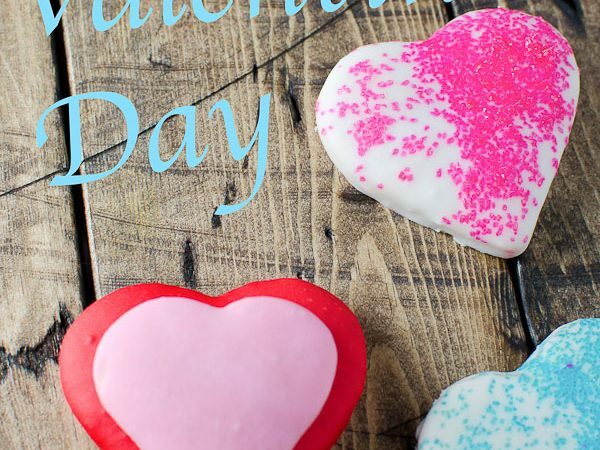 If you make these Valentine's Day Sugar Cookies, make sure to snap a pic and tag @theendlessmeal on Instagram so I can like and comment on your photos. I love seeing TEM recipes you create. 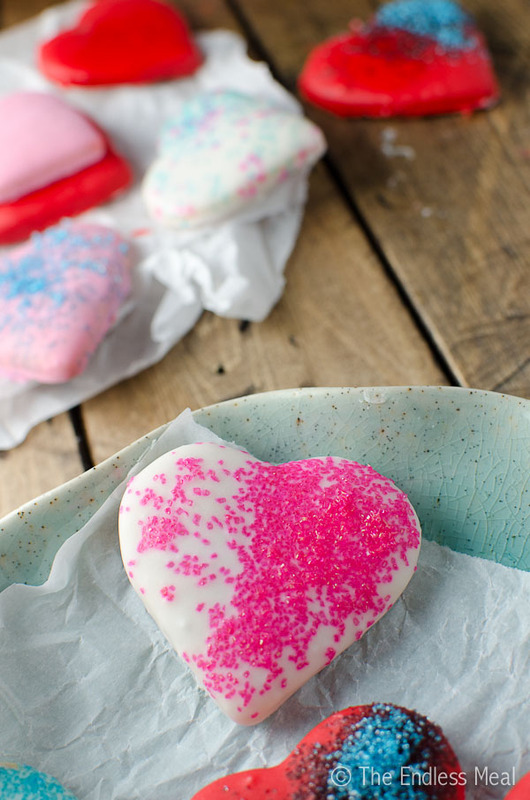 These easy to make Valentine's Day Sugar Cookies are so adorable! They are super fun to make and a great little treat. Preheat oven to 400 degrees. Roll out half the dough to just under ½ inch between 2 pieces of parchment paper. 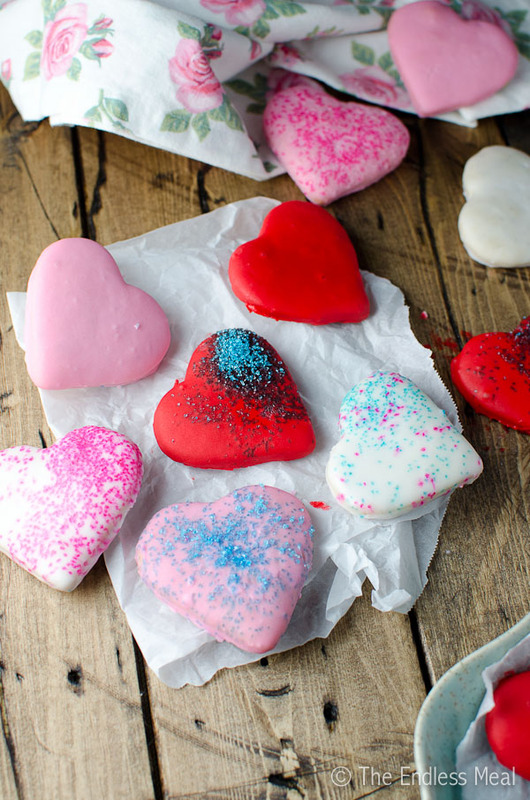 Cut out heart shapes and transfer the cookies to the prepared baking sheet. Divide the icing between 3 small bowls. Add a few drops of red to one bowl, a few drops of pink to another and leave the third white. Add the optional flavouring here. Set a bowl under a cooling rack. Working with one cookie at a time, pour the icing over the cookie and let the extra catch in the bowl below the cooling rack. Let the cookie set for about 1 minute before you decorate it with sprinkles. Let the cookies dry completely before storing them in an airtight container. *If you are not comfortable using egg whites in the icing simply substitute water instead. I’m with you on the anti Valentine’s Day thing too, Kristen. I think every day is a good day to show your loved ones you care. But I also admit that I like all the Valentine’s kitsch. It is pretty darn cute.